I skeined up the merino-silk yesterday. Ended up with just under the 8oz. 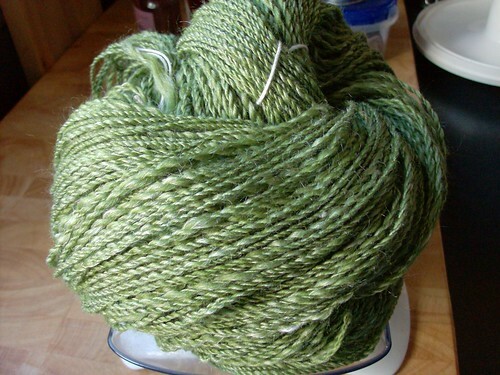 I started with – looks like I only lost maybe 1/8oz to “whoops”es, which is nice! Gave it a nice bath, and then let it lie in the sun for a bit to dry. I’ve got about 179 yards, and it seems to be averaging around 15 WPI. I’m pretty pleased with it. And yes, the color is pretty accurate in these, other than the drying picture. 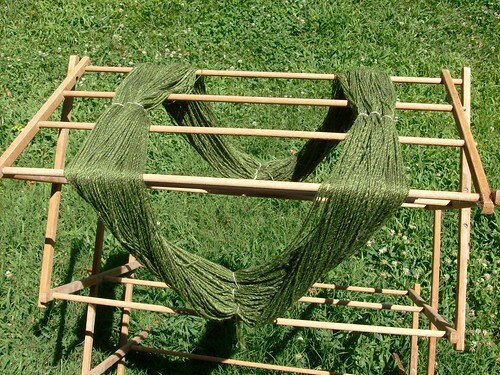 Yarn’s still wet in that one, so it looks darker than it really is. July 9th, 2009 | Tags: Spinning | Category: Misc. 9 comments to All Done! Loverly! Very pretty, love the green! 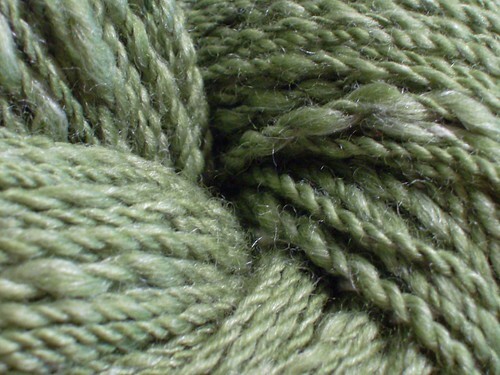 I’m knitting a sweater right now out of a similar color and eerily it’s also wool and silk! Looks fantastic! And hey, I never spin with a particular project in mind. In fact I spin about as un-scientifically as humanly possible. oooh love the way it turned out. really gorgeous. Lovely yarn! I really like the natural looking earthy green color it has. 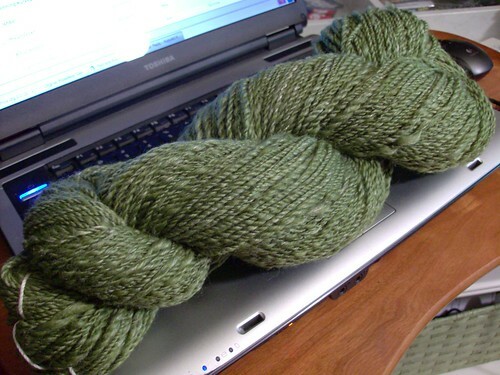 I know what you mean, the yarn I spin finds its projects too instead of spinning for a specific project. Unless we’re talking about socks, I can spin for socks, but usually it’s a surprise on what weight/gauge yarn I end up with.